A few weeks ago, I took part in one of the Weekly Challenges, called Creating Virtual Tours for E-Learning. 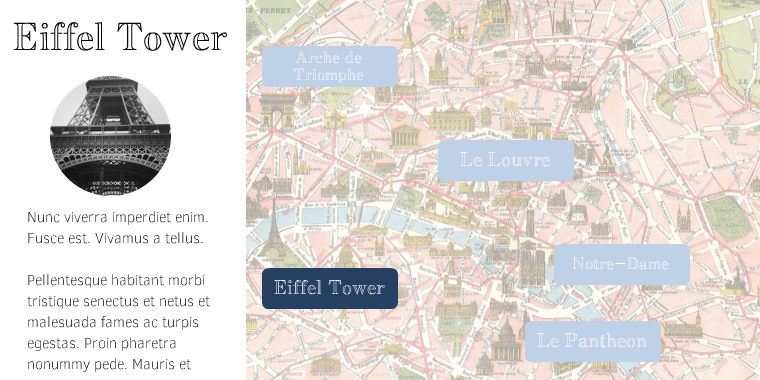 I knew right away that I wanted to create an interactive map of Paris using Articulate Storyline. Now—voilá!—I’d like to share a few tips on how I built this fun map of the City of Lights. I had already imagined the visual layout with the screen short and wide, similar to a wall map. So, I adjusted the size of my project by going into the Design tab and changing the story size. Then, I found this great map of Paris with really cool colors and icons. I inserted it as an image and cropped it so it fit just right. I also wanted to give this course an ”invisible” player that matched the blue on the map. So I customized the player colors and edited the background to make it the same as the map color. Next, I added the interactive elements to my map. For each of the icons I wanted to feature, I created a rectangle shape on the map with the name of the landmark. Then, I created a new slide layer for each landmark that had an image of the landmark and a paragraph of text. To add a bit of pizzazz, I added entrance animations to the objects on the slide layers. In general, I like my interactions and demos to have a clear start and a clear finish. So I created some variables that track when viewers visit each landmark on the map, and then added a trigger that displays the “Fin” (End) feedback window once viewers have visited them all. At that point, viewers can choose to exit the course or keep poking around the map. With the functionality built, I wanted to add a few enhancements to really polish off the interaction. I found this very French-sounding accordion tune, which I dropped into the intro screen as an introductory song. Then, I added this very elegant font, which fits in well with the design. Finally, I added what some in the Community call an “Easter Egg.” It’s a little surprise for viewers to find that appears at some point in the project. Can you find the one in this demo? If you do, post a comment below and let me know that you found it! Hi Nicole, This is a great visual tour (makes me want to go back to Paris soon!). Well done. In terms of the Easter egg, does it involve a dog drinking a fine French vintage and a baguette? Love the humorous touches. Would you care to provide the story as a download for us to study along with your excellent text? Aarf! Aarf! C'est tres belle, Nicole, merci bien! Bien fait! Brigitte - Thanks for the comment. What I did was create a True/False variable for each landmark, with a default value of False. When the layer with the landmark information appears, the Variable is adjusted from False to True. An additional trigger shows the "Fin" layer when all landmark variables are equal to true. Heres a link to a video tutorial that might help you: http://bit.ly/1r0Pk19. Good luck, let me know if you have questions. Thanks! Hi Nicole, Thanks! makes perfect sense and works a treat :) really like using variables. Little Parisian dog! Very cute. I love the font, theme colors and the variables you set. Great work. I am currently generating ideas for a mystery/detective style learning so this was helpful. Thank you!